My kids are thrilled about our holiday traditions – decorating the tree, hot cocoa, putting up stockings, a nativity scene, etc. – but let’s face it, they can also tend to edge into greedy territory if I don’t make a constant effort to refocus them. The constant commercials, displays at the stores, and their peers don’t help either! Christmas is so important and special to me, and I want the kids to keep a giving, generous spirit during this time. Encourage their talent by purchasing voice or music lessons, sheet music, instruments, etc. 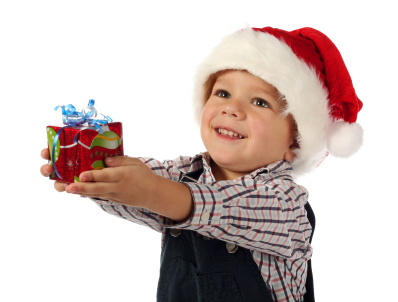 Volunteer and buy gifts for others: The number of ways to give during the holidays is endless! You don’t have to go far to look for opportunities – they are organized through schools, churches, banks, offices, etc. You also hear about ways to plug in on the news, on the radio, and in the newspaper constantly during the season. It can be overwhelming, so we have chosen a few as a family, and then have made them an annual tradition. Lead by example: The way I shop, the way I buy gifts for others, what I ask for myself, and the way I talk about Christmas, is truly what my children pay attention to. I have to practice what I preach, since my children are watching my actions. Buy responsibly: I love to buy fair trade items whenever possible, as well as shop local craft fairs, and buy from sellers whose products give back, like TOMS, FEED, or NoondayCollection. There are so many neat items to buy that have a positive impact on others. I also make sure as I do this, that I’m talking to my kids about why I do this. These are just a couple of ideas that I use for my own family to keep them centered, and to limit selfish behavior during the holidays. Every family is unique, and I know you have great ideas too!